Media Watch: a look at monocular football reporting. In today’s match we look at biased views on Watford’s home defeat to Chelsea. The game eded 1-2. The difference was to be two mistakes. Heurelho Gomes let a Eden Hazard shot squirm away from his body which substitute Michhy Batshuayi pounced on for the equaliser and with three minutes of normal time remaining, a poor pass from Adlene Guedioura was seized on by Cesc Fabregas and within seconds Diego Costa had netted the winner. A poor pass and a mistake led to the second Chelsea goal, says the Watford local newspaper. Fabregas was the instigator, winning possession on the edge of his own box and instantly threading a beautiful, bending pass that sent Diego Costa racing clear. The striker kept his cool as he bore down on goal, slipping his shot under Gomes and putting the Blues ahead very late on. He was quick to thank Cesc for the stunning through ball. A great pass and cool led to the second Chelsea goal, says the Chelsea FC website. Yet, as if they were Hertfordshire’s most ardent Trotskyists, Watford exist in a state of permanent revolution and yet more change is afoot: before kick-off new arrivals Younes Kaboul and the Argentine winger Roberto Pereyra were paraded to muted delight. Transfer balls: The BBC says Everton striker Romelu Lukaku, 23, “will turn down Chelsea to stay at Goodison Park for at least another season”. Romelu Lukaku is staying with Everton… The news is a massive boost for new boss Koeman. Chelsea have had a £57million bid for Romelu Lukaku rejected by Everton – but are confident of agreeing a deal to re-sign him this summer. The two clubs are haggling over a fee, with the Toffees holding out for a club-record £75million. But they have finally accepted the 23-year-old striker is determined to rejoin the club they bought him off two years ago. All wrong. 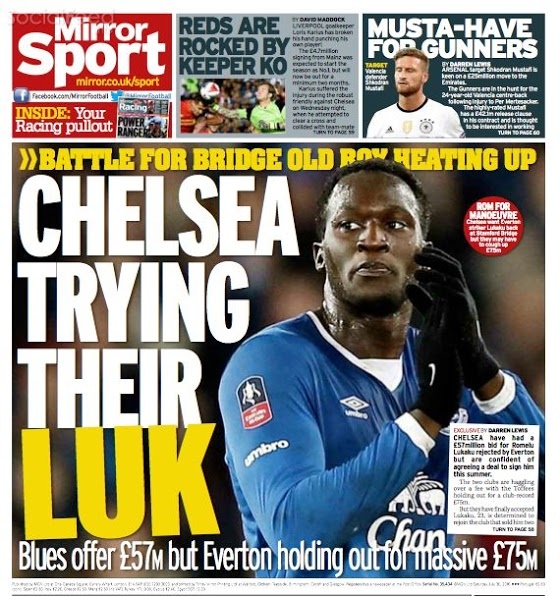 Lukaku is a Toffee. But Koeman has admitted that he is preparing a Plan B, in case the Belgium forward leaves the club. Everton are planning for life without Romelu Lukaku in the eventuality their striker departs this month. Chelsea are heavily interested in the 23-year-old and Ronald Koeman has targets lined up should they bow to a mega offer, as with John Stones and Manchester City. That Arsenal are looking fore a centre-back is daily news in the Press. Arsène Wenger’s side have been talking with Atlético Madrid over Uruguayan stopper José Giménez. Is he the man to full the voice caused by long-term injuries to Gabriel and Per Mertesacker? Valencia’s Shkodran Mustafi was supposed to arrive at the Emirates this week. But there has been no sighting of the German international. Although the Telegraph says: “Shkodran Mustafi to have medical on Monday after £29.5m fee agreed.” It also says former Manchester United player Jonny Evans is “free to make Emirates move”. Why would Arsenal want him? They need something fast. Arsenal look soft. The opening-day defeat against Liverpool showed that the Gunners are no longer a tough act. Wenger’s past decade has also demonstrated that, in football at least, good husbandry can be an overrated virtue. Arsenal built a 60,000‑seat home at a cost of £390m. But where once they had a proper football ground, vibrant with history and designed to allow the fans’ passion to influence the mood of a match, now they have an elegant bowl where the emotions are easily disengaged and the most familiar one is dissatisfaction. “If Mertesacker and Gabriel had not been injured in pre-season, we would have been less under pressure to sign a defender but once you are under pressure everybody knows you are, so it makes you weaker. We have been in the market a long time but, if you look around in Europe, all my friends I call are all looking for centre-backs but they cannot find them. True enough, Calum Chambers and Rob Holding, who partnered so ineffectively in Arsenal’s opening-day defeat to a pretty ordinary Liverpool side, point to the future. But neither look like win-hungry tough nuts in the mould of Tony Adams, Martin Keown or Steve Bould. Only one game into the season and Arsenal look like disappointing all over again. What news of Manchester City’s ranting goalkeeper Joe Hart? The BBC says Hart will “join Everton on loan”. The Daily Mirror agrees that Hart will leave on loans because Manchester City have are buying Claudio Bravo, 33, from Barcelona for £17.4m. But the Sun says Manchester City are “refusing to let England goalkeeper Joe Hart leave on loan”. They want him gone for good. When not shouting like the loon on the night bus, Joe Hart is letting in goals for England. Manchester City have seen enough, and are looking to offload the goalkeeper. The Mirror says Hart has told City teammates he will leave before the current transfer window shuts. 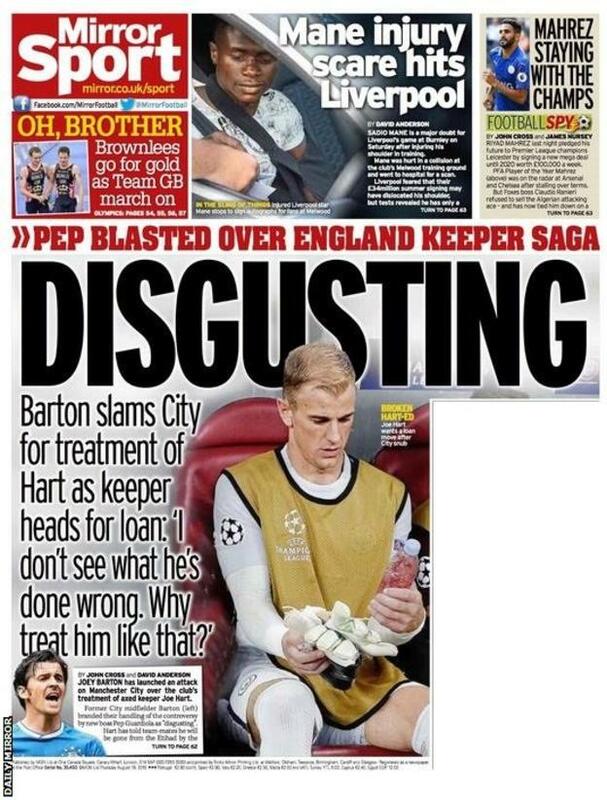 On Talksport, former City player Joey Barton says City’s treatment of Hart is “disgusting”. In the pantheon of disgusting behaviour, telling an overpaid footballer prone to clangers he is no longer first choice for his club is not disgusting. It’s sport. Disgusting might be, of instance, stubbing a lit cigar into the eye of young team-mate Jamie Tandy (as Barton did in 2004, when he was on City’s books), exacting common assault and affray in Liverpool city centre (Barton was jailed for his crimes in 2008), and assaulting Ousmane Dabo during a training match row in which the other player was knocked unconscious and punched repeatedly while on the ground (yep, Barton did that). “It is not the club I left. The club I left and watch now are two totally different organisations. The club I played for wouldn’t have treated a player that has been a servant for as long as Joe has in the manner that it has. It is disgusting. “He is a full international, somebody who, probably before City took the money, could have gone on to bigger and better things himself but stayed and wanted to be at City. “I don’t see what he has done wrong to be treated the way he has. His attitude isn’t terrible. I don’t like this. If Manchester City are taking lessons in common decency from Joey Barton, they really are in trouble. Modern football fans are in crisis. 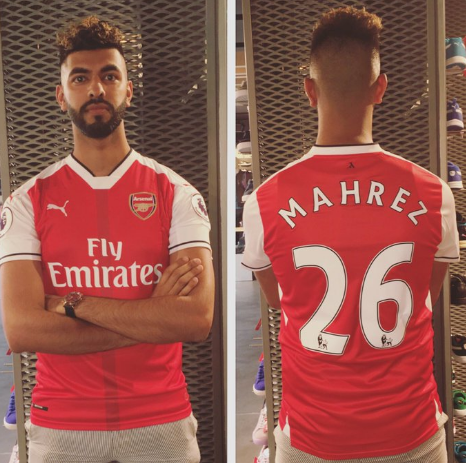 Get a load of the Arsenal fan who bought a replicate top and had the name “MAHREZ” stuck across the back. 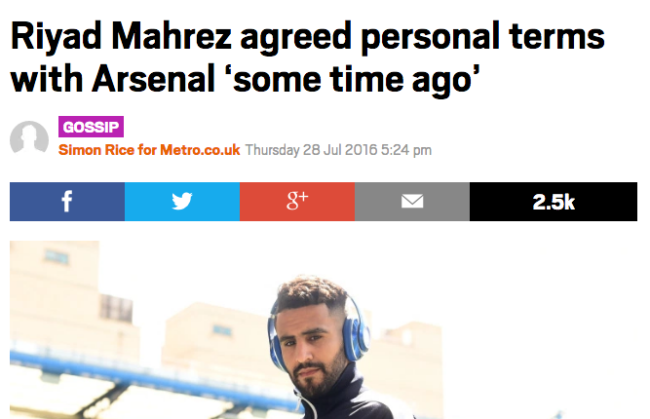 That’s Leicester City player Riyad Mahrez, who still plays for the Premier League champions. However, Balal was forced into an embarassing [sic] backtrack today after Mahrez signed a new four-year deal with the Foxes and he quickly took to Twitter to jokingly put his Arsenal no.26 shirt up for sale before deleting the tweet and saying he’s sending the shirt to a charity shop. PS – buying players is not the same thing as buying players for form a team. The modern fans’ desperation for big-money signings is pathetic. Blimey! Can a the former Barcelona player, a local boy done good, really join the Catalan club’s arch rivals? Have the pig’s heads on order. Cesc Fabregas is set to stay at Chelsea after being snubbed by Real Madrid, Barcelona, Paris Saint-Germain and Juventus. As Arsenal haggle over £30m fee for Shkodran Mustafi… will he join Luis Suarez, Gonzalo Higuain and Co on list of stars Arsene Wenger missed? In other words, the Mail was utterly wrong. One Watch: a look at mentions of Manchester United’s Jose Mourinho being a ‘One’. 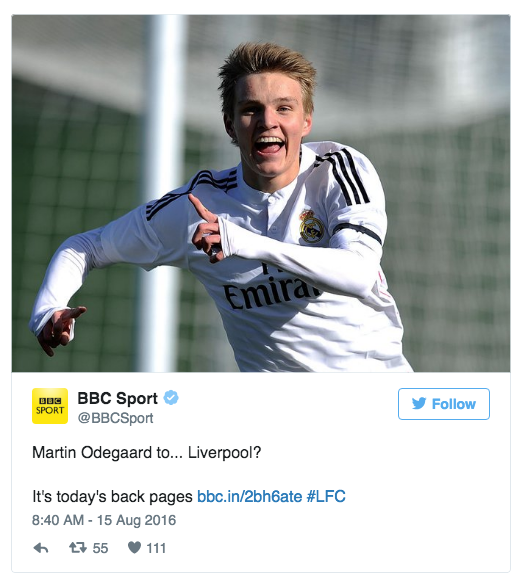 Transfer balls: Liverpool and West Ham are looking to sign Martin Odegaard. Well, so says the BBC. The BBC is state funded. Why it opts for clickbait is lamentable. The Telegraph says Mustafi has “agreed to sign a five-year deal at the Emirates stadium”. All agreed, then? No. 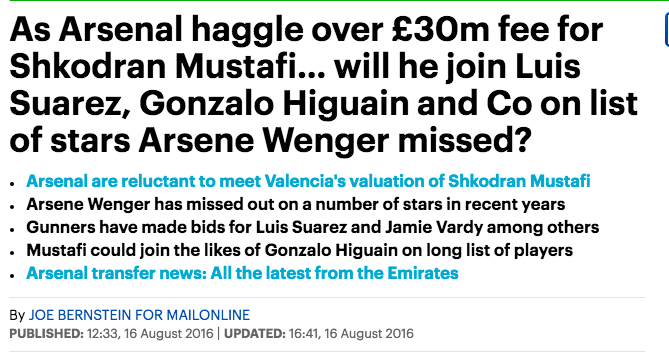 ESPN says today: “Arsenal could turn to Jeremy Mathieu should Shkodran Mustafi deal collapse.” The Sun says that Arsenal could hire Barcelona’s Mathieu to “solve their problems”. The problem is that when the trio of crocks are fit, buying Mustafi, a German international, will give Arsenal six first-class central defenders, the others being: Calum Chambers, Rob Holding, Per Mertesacker, Gabriel Paulista and Laurent Koscielny. And then there are fullbacks Nacho Monreal and Mathieu Debuchy ready to “solve their early-season central defensive crisis” (Mirror). Just eight first-team players, then, who can play at centre back for Arsenal. Although, according to Il Tempo, Debuchy is on his way to AS Roma. One problem, of course, is that every time Arsenal don’t win they throw nothing out. Rio 2016: The anti-Semitic Games? Israel’s Jewish athletes are being shunned at the 2016 Olympic games in Rio de Janeiro. Is it anti-Semitism? 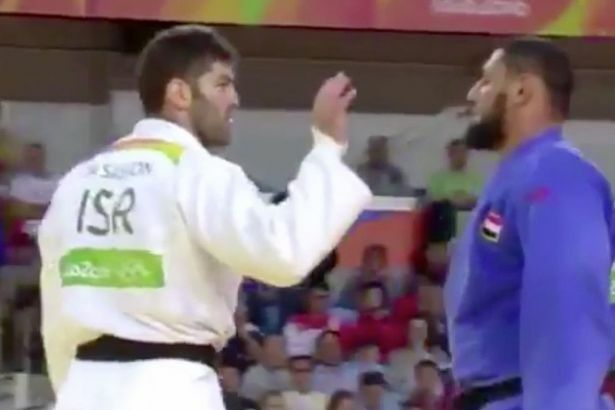 Beaten by Israeli fighter Or Sasson in the judo, Egypt’s Islam el-Shehaby refused to shake his Israeli opponent’s hand. He looked like a bad sport, and in a sports arena that’s no good thing. The Jerusalem Post says Syrian boxer Ala Ghasoun heard the call and refused to fight an Israeli athlete. The Washington Times reports says the Lebanese barred Israelis from boarding a bus. Israel say they invited Atrash to apply for a permit to travel to Jerusalem to use their facilities. She didn’t. Liel Liebovitz of Tablet Magazine added that there are several full-sized pools within the Palestinian territories. Football news: Tottenham Hotspur midfielder Christian Eriksen thinks his current contract undervalues his talents. The Dane is seeking to extend his contract, which has two years left to run, by securing a 368.75% pay rise. Eriksen earns a basic weekly wage of £32,000. The Telegraph says he is seeking £150,000 a week – much more than Spurs top earner Hugo Lloris’ 95,000 per week. This, says the paper, has “stunned” Spurs. Balls. Spurs is owned and run by money-men. They know the market rate for a very good footballer playing Champions’ League football. They also know that a good club should strive not have the best players but the best team. Is Eriksen a key part of an improving Spurs side? Yes. Can he be replaced by a cheaper and better player? Yes, of course he can. The hard thing is identifying and signing that player. Spurs also know Eriksen’s worth if he’s sold*. Should they cash in? *Unless a marketing spod at Manchester United, a desperate club in thrall of commercial possibilities, thinks Eriksen can sell merchandise, then any fee can rocket (see Paul Pogba). “Paul Pogba settles back in at Manchester United by teaching team-mate Jesse Lingard his Dab dance celebration” – The Sun, August 9. “Jesse Lingard teaches Manchester United team-mates Timothy Fosu-Mensah and Cameron Borthwick-Jackson how to dab as the craze continues to spread” – Daily Mail, July 28. Next week: How Pogba inspired United to victory in last season’s the FA Cup. One player linked to Middlesbrough is ‘Ekstra Bladet’. Who he? Former Ajax captain Nicolai Boilesen is a free agent. He’s Danish. Ekstra Bladet is a Danish newspaper, whereon you can read all kinds of footy news abut Danish footballers. The Sun is a newspaper that accidentally cites its sources. And so a mere 19 days since the Daily Mirror told us Pogba had “signed” for Manchester United, the paper reports that Pogba has signed for Manchester United. 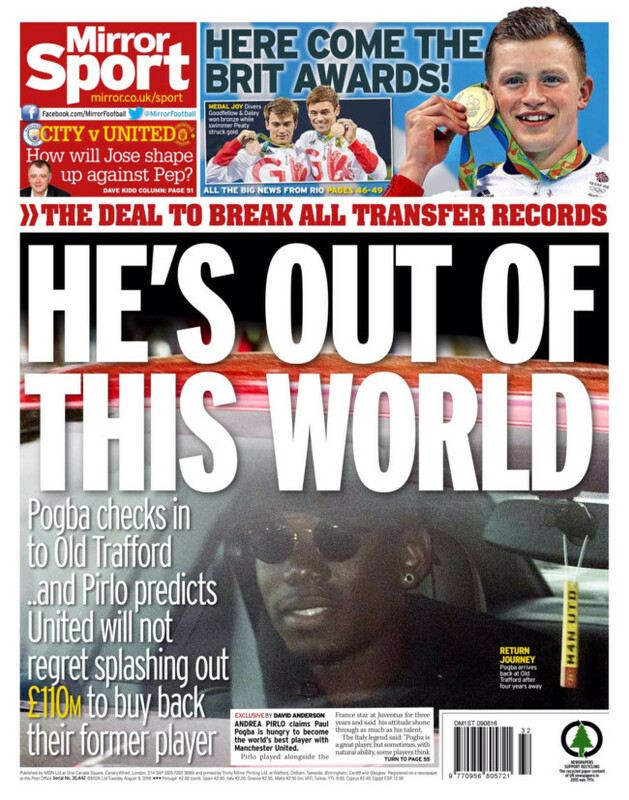 Lest anyone think the Mirror was ahead of the pack in anything other than guesswork, in the intervening days its reader have read a lot of stories about the Pogba. Total balls in the Mirror, then. Of course, Sun readers know Paul Pogba plays for Chelsea. Such are the fats in the trusty mainstream media. Can the hyperbole begin before a ball has been kicked in the Premier League? Silly question. The Evening Standard looks at Arsenal and declares the club to be in a state of “crisis”. So are Arsenal in Crisis? Of course not. Arsenal’s Per Mertesacker and Gabriel are injured but the Gunners can call on Laurent Koscielny, Calum Chambers, new signing Rob Holding or play left-back Nacho Monreal in the middle. No. Because Arsenal do not have a striker crisis. Transfer balls: Has Romenlu Lukaku rejoined Chelsea from Everton? No. But the papers keep reporting that he could, telling readers of failed bids and makeweight players in swap deals. Daily Mail, August 1: “Romelu Lukaku has told his Everton team-mates he wants to leave this summer. Chelsea have offered £68million for the Belgium international but Everton want £75m as reported in Sportsmail last month. The Sun says Chelsea “have already had a £65million offer turned down”. And so to today’s news. The BBC says Chelsea have not made a single offer for the big Belgian striker. 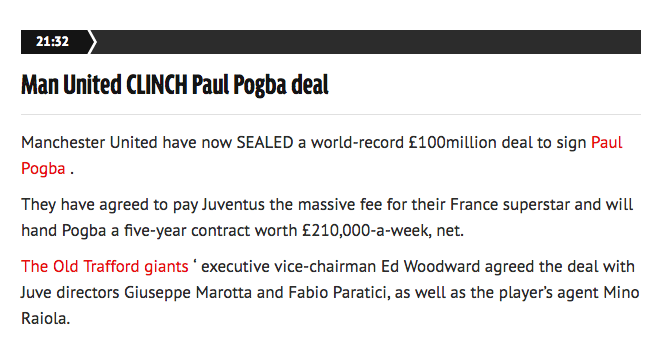 Transfer balls: It’s been 17 days since the Daily Mirror told us Pogba had “signed” for Manchester United. Today the BBC tells us that Pogba has been “summoned to Juventus training”. To say goodbye to his former teammates? No. To train for the Italian season with his current club, Juventus. Pogba’s secret arrival is all over the newspapers. After arriving in secret last night, the Frenchman, 23, will be undergoing his medical at a top secret location ahead of a world-record transfer to Old Trafford. Italian newspaper Gazzetta dello Sport claim the Juventus star touched down in the UK yesterday and will today complete his move to United. The report says Juve boss Massimiliano Allegri’s comments yesterday about Pogba expected for training were merely a smokescreen. The Italian newspaper says there are no “photographs chronicling Pogba’s arrival” because it was all top secret and only the Press in Italy and the UK know anything about it. Today. The Press have been telling readers Pogba is joining Manchester United ‘today’ for many, many days. Paul Pogba has not joined Manchester United. 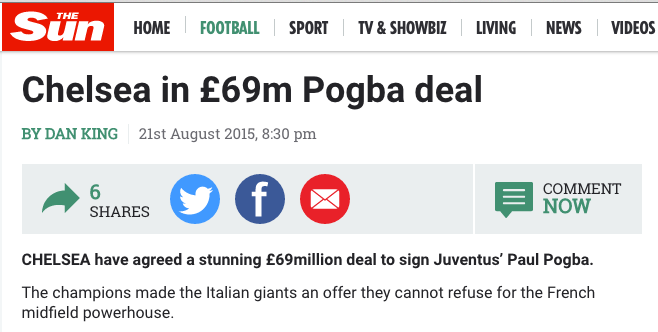 It’s been 16 days since the Daily Mirror told us Pogba had “signed” for Manchester United. Today the Telegraph says Juventus are “stalling” on agreeing for their player to leave the club. “They’re killing the mood, drastically,” says the paper. What did he say, teasingly? In other words: no news. But the Press is desperate for something. So instead of the Olympics and the start of the non-Premier League football season, the lead story is about Jose Mourinho and Paul Pogba. 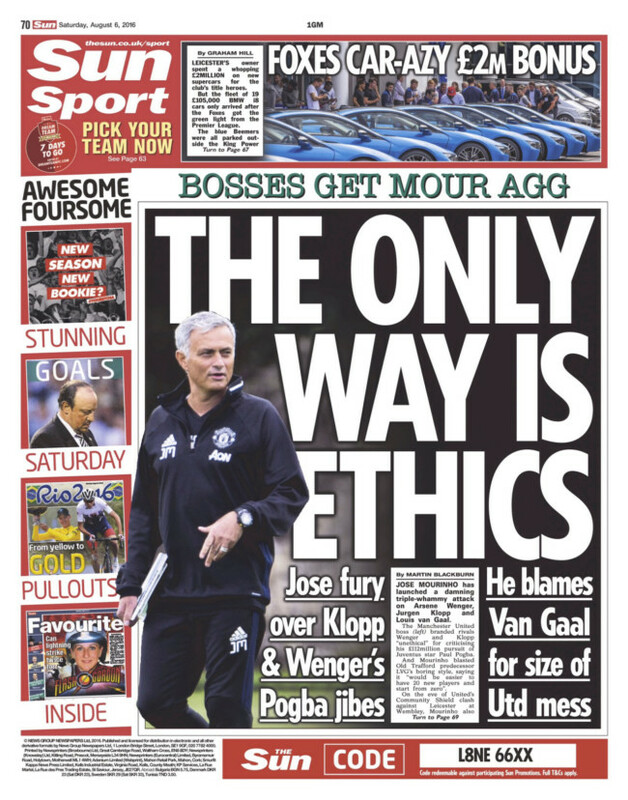 The Sun – the paper that told Paul Pogba plays for Chelsea – hears the “fury”. 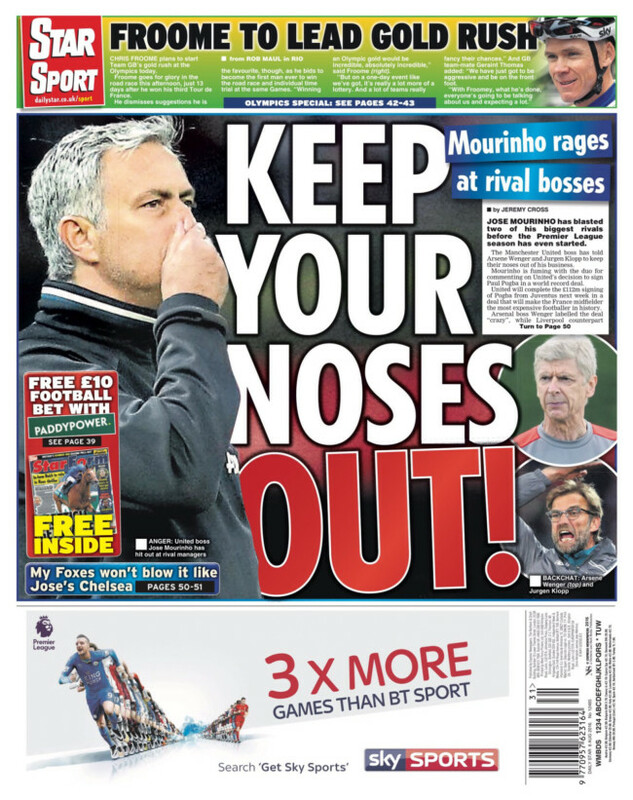 “Jose Hits Back,” says the Express. 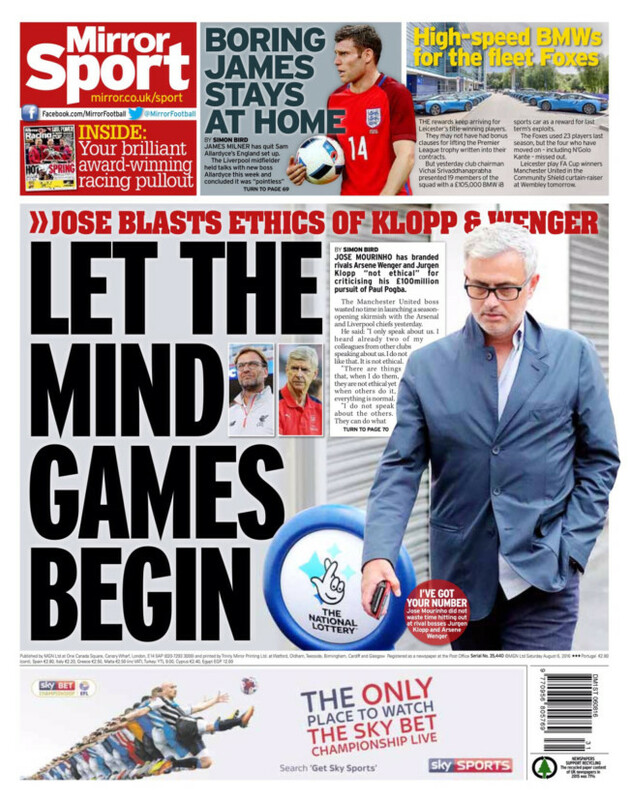 The Mirror – “the intelligent tabloid” (self-declared) that told us Paul Pogba joined Manchester United 16 days ago – senses the “mind games”. And that’s it. The Times calls those words a “withering rebuke to Jürgen Klopp and Arsène Wenger”. Oh, come on. It’s just Jose Mourinho being snippy. Plus ca change. The Premier League season cannot begin soon enough. He never did arrive ‘today’. Other sources wee just as wrong. Pogba to Manchester United was all beaten by the story of Pogba to Chelsea. It too was a done deal. Since the Blues slumped to a 3-0 defeat at City on Sunday, the Russian has sanctioned a huge seven-day spree, signing Abdul Baba Rahman, Pedro and now Pogba. Chelsea did not sign Pogba. When he appears for Manchester United, then we’ll believe Pogba has rejoined the club he left four years ago. 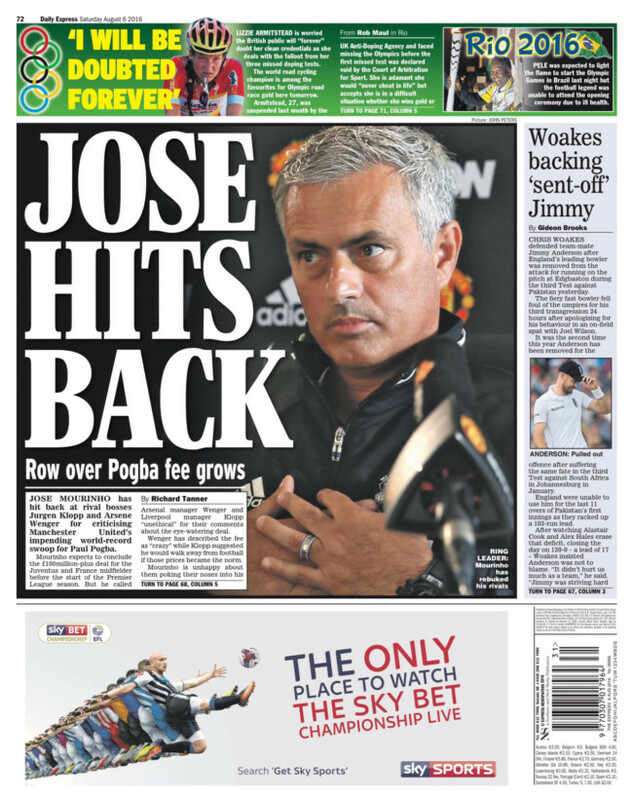 It’s been 15 days since the Daily Mirror said Manchester United had signed Paul Pogba. Today the Manchester Evening Post reports that “Paul Pogba is still a Juventus player”. The Telegraph says Pogba “is expected to sign” for Manchester United. 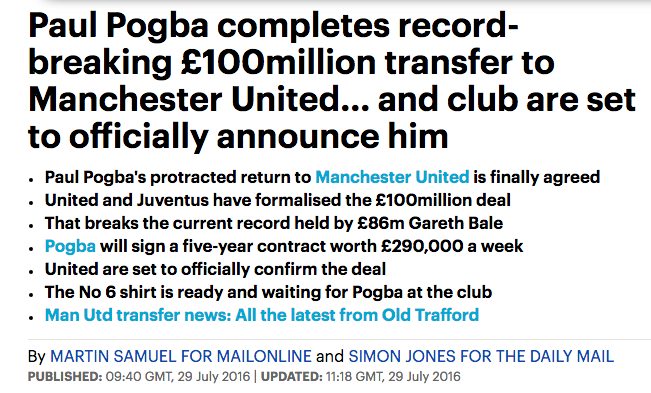 The paper of record then states: “The Manchester Evening News believe Paul Pogba is officially a Manchester United player.” No, they don’t. The MEN says he is expected to sign. But Pogba surely is leaving Juventus. 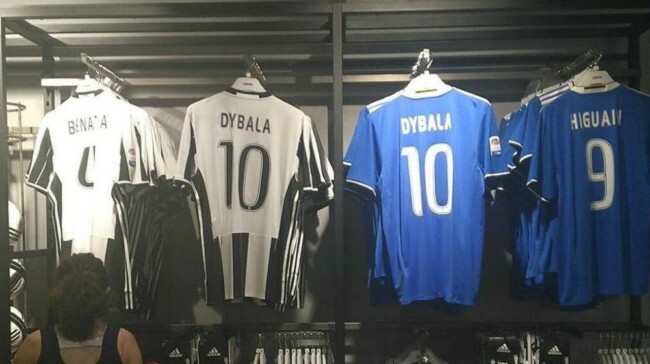 AS reports that Pogba’s number 10 shirt at Juve is to be worn by Dybala. One woman dead. Five others stabbed in what the BBC calls a “London attack”. The dead woman was knifed to death in Russell Square. She was in her 60s. The suspected killer is 19. He has been captured alive. No guns. He was Tasered. London Mayor Sadiq Khan wants everyone to be “calm and vigilant”. Not quite. The Met also say it might be a terror attack. There are fears that the knifeman operated with an accomplice as the Met refused to rule out arresting more suspects. One witness said he saw ‘a man flee on a motorbike’. Others suggested a gang may have been involved. Suggested. May. Fears. What about facts? Middle-eastern descent? What an odd description. Are they Arabic looking? Is this, then, the sort of stabbing incident that occurs in Israel? The Sun has more on the “bloodbath”. A WOMAN in her 60s has been killed and five others injured in a bloody central London knife attack that police believe may be terror-related. Unlike the BBC, mental health and a random killing is not the central issue. To the Sun, this is about terror. A 19-year-old man was arrested at the scene after being tasered by police in Russell Square – just yards from where the 7/7 attacks bus bomb detonated in 2005. Four women and one man were also injured in the horrific attack in Russell Square. One witness described seeing another man ‘flee from the scene on a motorbike’ as police confirmed mental health was a likely factor. They said: “I heard a scream, and then we went to the park and I saw a girl lying on the floor with blood coming from her back. Another girl had blood on her arm. “They all spoke Spanish so I guess they were a group. I only saw the victim and the girl with the arm stabbed from that group. Knife attack in London’s Russell Square leaves woman dead and five injured – Police say 19-year-old man arrested and mental health a significant factor in the attack. No. They said it could be a factor. The Guardian and the BBC are setting the story to fit an agenda. The Sun and Star are saying what many wonder when they first hear of such an attack. No-one panic. No-one mention the war. Paul Pogba has not signed for Manchester United. But he could sign for Real Madrid because “Zinedine Zidane’s side play Bayern Munich at the MetLife Stadium on Thursday morning”. United continue to play the waiting game with no official agreement in place for Pogba’s signature. No official agreement. Is that the same as no agreement whatsoever? Manchester United transfer news and rumours: Could Paul Pogba be heading to New York for a medical today? The paper has no idea. And having asked its readers, it still has no idea. On the brink? Fours days ago it was a done deal. Martin Samuel and Simon Jones told us the deal had been “finally agreed”. United are eager to parade their new signing – who completed a medical in Los Angeles. Over in Spain, news in AS is that Pogba is expected to sign for United on Wednesday. Madrid have given up the hunt.